Looking to mix up your usual ladies’ night circuit without having to fork out for a cab to take you half way across the city between bars? Then let us introduce you to a new dine-around ladies’ night at The Pointe. Six of the restaurants at the new Palm Jumeirah destination have teamed up for a fun new ladies’ night that best of all, takes place every Thursday. 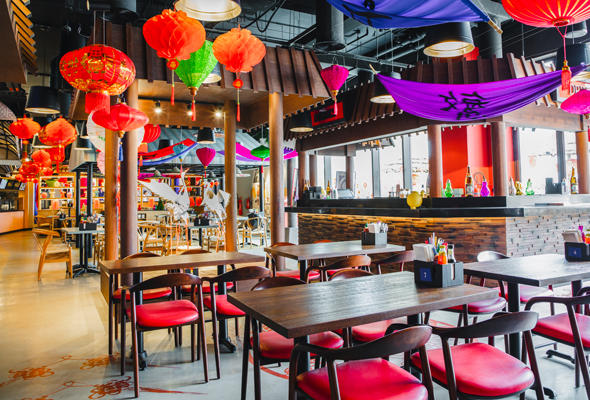 From 7pm to 11pm, ladies can enjoy four complimentary drinks at street food hall Asian District, seafood restaurant Seafood Kitchen, European bistro Fitzroy, funky Mexican joint La Palapa and Asian restaurants Mama Pho and Fat Chow. But it’s not just about drinks. Ladies can also avail a 25 per cent discount at any of the participating restaurants too. So whether you’re fancying Asian sharing plates, freshly caught seafood or some traditional European dishes, you and your squad will be covered. It’s a limited-time ladies’ night, so you’ll need to book in a girls night before April 30 to avail the deal. Elsewhere at The Pointe, there are plenty of other ladies’ night deals to be had if you head down on a Wednesday. At Palmetto restaurant and cafe, ladies can enjoy free drinks from 8pm to 11pm and 30 per cent off the food bill, while per Te, the Italian-inspired spot offers ladies 5 complimentary house beverages from 9pm to midnight on Wednesday too.